Find Out The Bagsamoré Top Three Tips In How To Get The Most Out Of Your Investment. How To Look After Your Designer Bag. Bagsamoré has been working with our friends at Modsie.com.au to put together a perfect care routine for your new purchase. Modsie is an Australian second-hand luxury marketplace specialising in all things designer including handbags. It is important to look after your investment and to get the most out of it, so here is Bagsamoré’s top three tips on how to care for your designer handbag. Purchasing your dream designer handbag is exciting but can be overwhelming when it comes to care. Don’t let the fear of dye transfer, or over use put you off using your bag altogether. By following these three simple rules you can keep your designer handbag looking its best for longer. This may seem obvious to some, but even the most unlikely of bags benefit from being stuffed when not in use. This bag stands tall from new and is made from a hard wearing leather called Saffiano leather. But don’t be fooled, from new, leather can seem stiff and rigid, but over time this natural material will become softer, it’s fibres loosening below the surface. This will eventually cause the handbag to slouch and lose its shape. Leather softening is an inevitable process that cannot be 100% prevented, however stuffing the bag (even just over night) will help to prolong the life of the leather, maintaining its shape. Wardrobe displays are everywhere we look! The fascination of looking inside these beautiful closets and getting a sneak peek at enviable handbag collections is a fast growing trend. While these wardrobes may look pretty, they could be causing long term damaging effects to our handbags. When you purchase a designer handbag it will always come in its own dust cover. This is very important! Do not throw it away. Not only do these dust covers help to maintain the value of your item but they also play an important part in its appearance too. When storing your handbag away in your wardrobe you should always make sure it is in its dust cover. This protects the bag from gathering dust and dirt on the surface, but more importantly, it protects it from sunlight damage. Here in Australia the sun is so strong and even through the windows its rays can affect your handbags. The UV can cause the colour to fade and the leather to dry out. This may not be something you see happening instantly, but gradually over time the effect of the sun will be apparent. 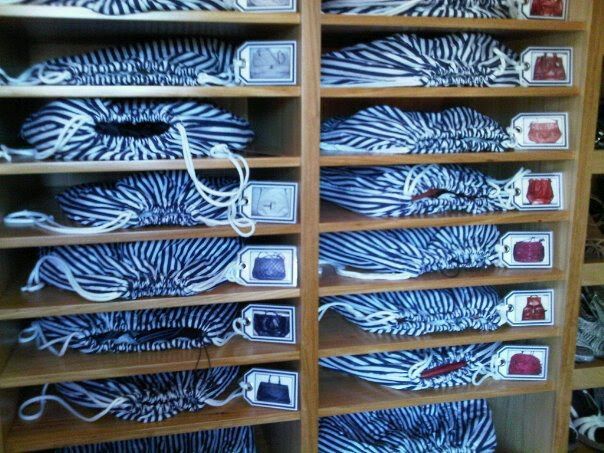 Here is a great idea for storing your bag in dust covers, each labelled with an image of the bag so you can identify which is which! It may be one of the last things on your mind when you purchase a bag but knowing how to clean and protect your item is so important. You shouldn’t have to be afraid to wear your new white leather bag with your favourite pair of jeans. Did you know that by protecting your bag before use can help to prevent problems such as dye transfer, liquid staining and any other emergency spillages. By protecting your bag before you begin to wear it, you can carry it with confidence. A protected bag is also easier to clean and maintain, helping to prolong the life of the leather. Some protection treatments also help to prevent problems such as UV damage. Waterproofing sprays are ideal for items made from suede or fabric, but should not be used on any other type of leather. The silicones in waterproofing sprays eventually dry out the leather, creating an impenetrable layer on the surface. Leather needs moisture to stay soft and supple. Depending on usage, you will need to deep clean your bag once or twice a year and regularly wipe over your bag every other week. This is to eliminate any dirt build up on the surface. Why is this important? When dirt is left to sit on the surface for too long, the abrasion will begin to wear away the delicate finish. The finish is an invisible layer on the surface which is there to protect the leather underneath. If this layer is compromised your bag will become more susceptible to staining and cause long term damage to its colour and texture. These are all things that can damage the finish. The best cleaners are water based, with no waxes or oils. 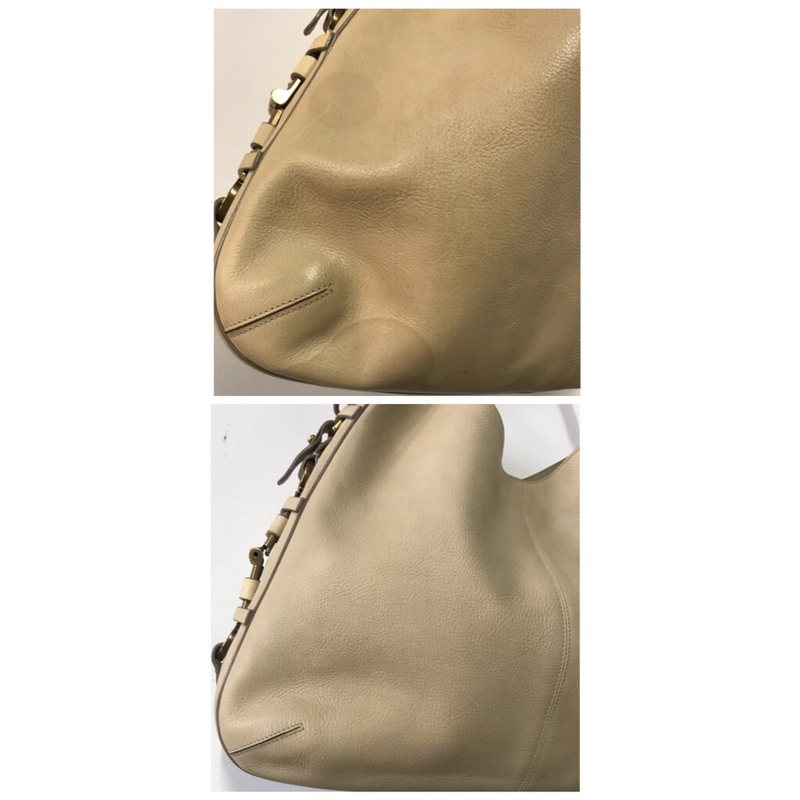 At Bagamoré, we offer a Protection Treatment for brand new handbags for $35. With the purchase of every Stain Protect service we will take 25% off the next cleaning service on that bag. It’s the perfect maintenance package which can cost you as little as $130 per year! If your handbag is looking a little tired, why not send it to Bagsamoré for a makeover? We can restore all kinds of problems. Contact us today with your problem and see how we can help!